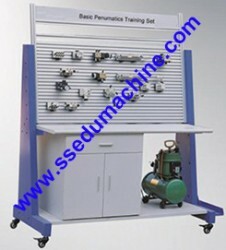 Basic pneumatic trainer is designed for “hydraulic and pneumatic training”, it meets modern pneumatic transmission requirement. 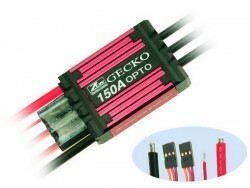 Students can learn basic pneumatic circuit control knowledge, and practice hand on ability. 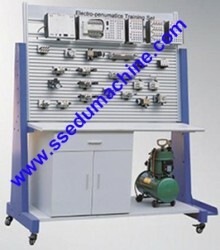 Pneumatic trainer combines electrical and mechanical transmission knowledge. 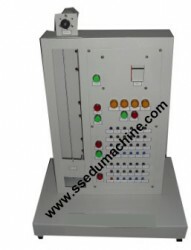 This trainer is suitable for colleges, engineer university, technical schools, vocational schools, engineer training centers, factory training department etc. 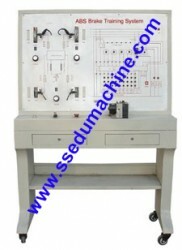 Through this trainer, students can master pneumatic components structure, pneumatic circuit control theory, pneumatic circuit design, and hand on ability for pneumatic trainer. This trainer is flexible and students can design their own pneumatic circuit. 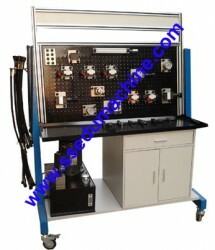 1． Workbench has 4 wheels, it is suitable for move and installation. 2 wheels can be lockable. 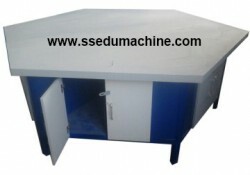 It use aluminum panel, the distance for slot is 25mm, there is quickly plug in and plug out sockets under components, students can plug components on aluminum panel easily. 2. 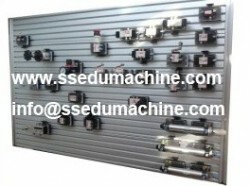 Every pneumatic component is an individual module, it has quickly plug in and plug out sockets, can put in aluminum panel and build pneumatic circuit. 3. 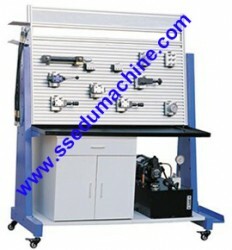 Use stainless air compressor, running has low noise, it supply good environment for training. 4. 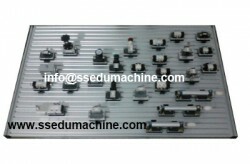 Pneumatic circuit use quickly plug in and plug out leads, it is suitable for students to build pneumatic circuit. Students can combine theory to practice, and practice hand on ability. 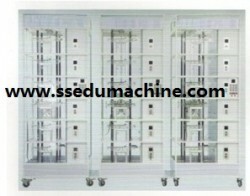 Jinan Should Shine Import nd Export Co., Ltd.